Delphi has authored a new report, “West Coast Clean Economy: 2010-2014 Jobs Update,” that demonstrates that climate and energy policies across North America’s west coast have spurred job creation and economic growth. The four jurisdictions highlighted in the report – British Columbia, California, Oregon, and Washington – represent the members of the Pacific Coast Collaborative (PCC), a regional forum that serves as the basis for cooperative action, leadership and information sharing on climate and energy issues. The PCC represents the world’s fifth largest economy, a region of 53 million people with a combined GDP of $2.8 trillion. Their actions are a reminder that sub-national actors can have a tremendous impact on the transition to a low-carbon economy. 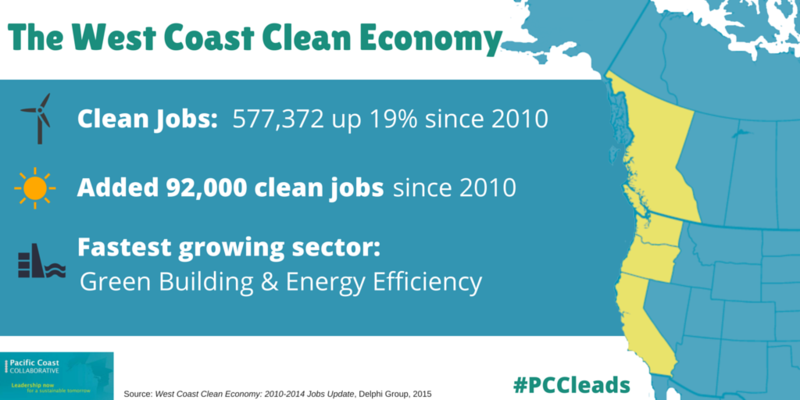 The clean economy growth rate in the Pacific Coast Collaborative region is more than twice (2.2 times) as fast as the region’s overall job growth. As of 2014, the region includes 577,372 clean economy jobs, an increase of 91,656 (approximately 19 percent) since 2010. Click here to access the media release.